Using delicate needlepointing techniques, artist Mia Weiner creates charming zodiac embroideries. Using delicate needlepointing techniques, artist Mia Weiner creates charming embroideries for each sign of the zodiac. 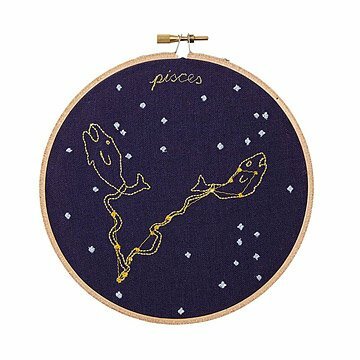 Whether you're an avid astrology follower or you simply love to star gaze, each linen needlepoint presents a beautiful celestial scene that pays homage to your sign. The piece hangs on a simple wooden hoop, lending homespun appeal to each unique design. Handmade in Queens, New York. Mia Weiner believes in everything embroidered! She created the line HOW COULD YOU? to share her handmade and unique objects with the world. Using historical techniques to create new works, Mia stitches her intimate embroideries with love in her New York studio. Originally from Chicago, Mia has lived and studied in Baltimore, Turkey, Greece, and Berlin. She values the handmade and in bringing beauty to everyday life. In addition to HOW COULD YOU? Mia exhibits her fiber work internationally through her fine art practice. Read a Q&A with Mia. It sits atop a window in my living room for all to see. beautiful & such great quality!